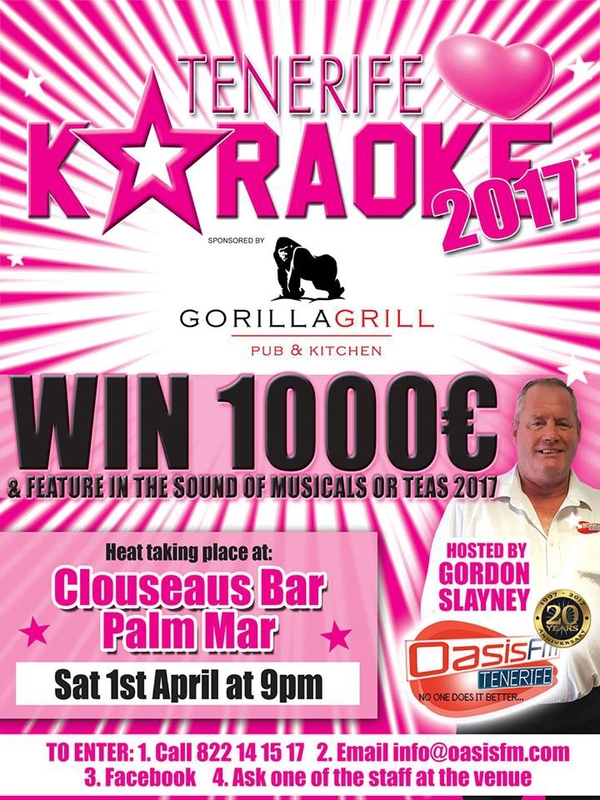 The next heat of Tenerife Loves Karaoke 2017 is at the Clouseaus Bar, Palm Mar on Saturday 1st April with fun starting at 9pm. The night will be hosted by Gordon Slayney and sponsored by Gorilla Grill Tenerife. The winner of this heat will become the fourth person to be in this years final in June at Showtime Las Americas. So if you want the chance to win the 1000€ and feature in the Sound of Musicals or TEAs 2017, register TODAY as there are only limited places. To enter call us on 822 14 15 17, email us to info@oasisfm.com, send us a PM Facebook message or register direct at the bar... don't delay, register TODAY.